The loggerhead turtle is named for its exceptionally large head. The loggerhead sea turtle are a common species in South-East Florida, second only to the Olive Ridleys which are the most abundant. Loggerheads regularly nests on the U. S. Atlantic Coast, on beaches from New Jersey to Texas, including the beaches of Paslm Beach County. Head is very large with heavy strong jaws. Carapace is bony without ridges and has large, non-overlapping, rough scutes (scales) present with 5 lateral scute. Carapace is heart shaped. Front flippers are short and thick with 2 claws, while the rear flippers can have 2 or 3 claws. Reddish-brown, slightly heart-shaped top shell (“carapace”) with pale yellowish bottom shell (“plastron”); hatchlings are brown to dark gray. Typically 2.5 to 3.5 feet in carapace length (80 to 110 cm). Adult weigh between 155 and 375 pounds (70 to 170 kg). In the southeastern U.S., mating occurs in late March to early June and females lay eggs between late April and early September. Females lay three to five nests, and sometimes more, during a single nesting season. The eggs incubate approximately two months before hatching sometime between late June and mid-November. Nest at intervals of 2 to 4 years. They lay 3 to 6 nests per season, approximately 12 to 14 days apart. Lays average of between 100 to 126 eggs in each nest. Eggs incubate for about 60 days. Most nesting occurs north of the Gulf of Mexico and Caribbean Sea in temperate waters, although some individuals nest in the western Caribbean. Loggerhead sea turtles also nest along the southeastern U. S. coast, with 90 percent of nests occurring in Florida. Females come out of the water to lay their eggs on beaches at night. An individual may nest up to 7 times in a single season, laying 100-125 eggs every 14+ days. The eggs hatch in 55-65 days; the hatchlings emerge at night . Immediately after hatchlings emerge from the nest, they begin a period of frenzied activity. During this active period, hatchlings move from their nest to the surf, swim, and are swept through the surf zone, and continue swimming away from land for up to several days. After this swim frenzy period, post-hatchling loggerheads take up residence in areas where surface waters converge to form local \. These areas are often characterized by accumulations of floating material, such as seaweed (for example, Sargassum), and, in the southeast U.S., are common between the Gulf Stream and the southeast U.S. coast, and between the Loop Current and the Gulf Coast of Florida. 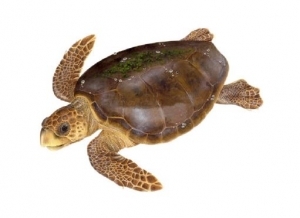 As post-hatchlings, loggerheads may linger for months in waters just off the nesting beach or become transported by ocean currents within the Gulf of Mexico and North Atlantic. Once individuals get transported by ocean currents farther offshore, they’ve entered the oceanic zone. Within the North Atlantic, juvenile loggerheads have been primarily studied in the waters around the Azores and Madeira (Bolten 2003). The juvenile turtles around the Azores and Madeira spend the majority of their time in the top 15 feet (5 m) of the water column. Somewhere between 7-12 years old, oceanic juveniles migrate to near-shore coastal areas (neritic zone) and continue maturing until adulthood. In addition to providing critically important habitat for juveniles, the neritic zone also provides crucial foraging habitat, inter-nesting habitat, and migratory habitat for adult loggerheads in the western North Atlantic. To a large extent, these habitats overlap with the juvenile stage, the exception being most of the bays, sounds, and estuaries along the Atlantic and Gulf coasts of the U.S. from Massachusetts to Texas, which are infrequently used by adults. However, adult loggerheads are present year-round in Florida Bay, an important feeding area, probably because of relatively easy access to open ocean and migratory routes. The greatest threat is loss of nesting habitat due to coastal development, predation of nests, and human disturbances (such as coastal lighting and housing developments) that cause disorientations during the emergence of hatchlings. Other major threats include incidental capture in long-line fishing, shrimp trawling and pollution. Incidental capture in fisheries is thought to have played a significant role in the recent population declines observed for the loggerhead. Population estimate ranges between 40,000 and 50,000 nesting females. Loggerhead sea turtles and eggs are hunted extensively in many parts of the world. In the U. S., however, the main threat is from raccoons, who may destroy countless nests on a given beach. However, in Florida, predation rates on nests are actually remarkably low. Encroaching human populations are also a threat. In Florida, almost the entire coastline is developed, under development, or subject to development. The introduction of exotic vegetation by humans may form dense root mats along shores, inhibiting egg-laying and trapping hatchlings. Beds of sargassum weed, where the early part of the life cycle is spent, accumulate pollutants such as oils, styrofoam and other plastics. Listed as Threatened under the U.S. Federal Endangered Species Act. International – Listed as Endangered (facing a very high risk of extinction in the wild in the near future) by the International Union for Conservation of Nature and Natural Resources.